Hello! My name is Heli and I am a Senior majoring in Biology. 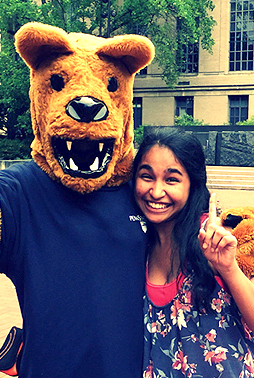 After Penn State, I want to attend a Physician's Assistant program and hopefully specialize in Emergency Medicine. I was born in India and moved to Horsham, PA in 9th grade. Even though I haven't traveled much yet, I hope to do so in the future because I love learning about and experiencing different cultures. I absolutely love being at Penn State and in my free time I like to eat ice cream at the creamery, attend on campus concerts and movies, go to sporting events and try out new restaurants. I served as a mentor for AASIA program last year and this will be my first year as a coordinator. I am really looking forward to working with all the mentees, mentors and other coordinators to make this experience as amazing for you as it has been for me so far. I have been here at Penn State for 3 years now and have learned many things that make the transition from high school to college easier. I would definitely love to pass on what I've learned and help you in any way I can. I am really easy to talk to and a very good listener so if you ever need help with something or even if you just want someone to hang out with, definitely come find me.